The prompt this time was about sea stars (formerly called “starfish”). I read some information about them out loud, and was struck by the way they can regenerate lost limbs. 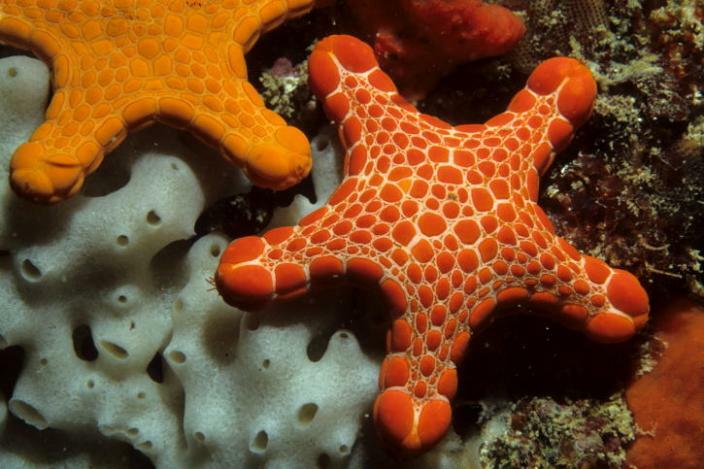 Sea stars have an eye spot at the end of each arm. Sea stars can move more quickly than you might expect. Sea stars are famous for their ability to regenerate limbs, and in some cases, entire bodies. Sea stars can live up to 35 years and are usually about the size of a teacup. What I wrote in response is below. Everywhere, kindness. That’s what he’s choosing to see, anyway. That’s what he’s open to. The news fills the airways with horror, loss, murder, disease. Our world is spun into chaos: the end of times. So it seems surreal to notice a sparrow’s carefully constructed nest in the pipes above the carport, the old man in the donut shop having a conversation with a curious toddler, or to read about the Labradoodle who works as a therapy dog at a funeral home, and a herd of elephants who travel 20 miles to mourn a dead man who worked with them for decades and loved them. They came to pay their respects. Then there’s the woman who waited to pull out of her parking spot on a busy Friday night so he could have her space. There was a line of cars behind him, so he couldn’t back up. “Go around the block,” she said, “I’ll wait for you.” A total stranger. And the clerk at his accountant’s office who so appreciated his interest in her African Violets that she gave him two leaves in a Dixie cup of water. “In about two weeks, you’ll have roots,” she said. “Plant them in soil and then keep them somewhere warm.” On the street outside the office, he used his hand to shield the flimsy leaves from the windy day. Once he was safely inside the car, he placed the paper cup in the beverage holder, careful not to spill it. There are greater acts too. SS soldiers who worked as double agents and saved thousands from the gas chambers in Auschwitz. Now, two ninety-year-old survivors—one a former guard, the other a former prisoner whom he saved—meet again in Germany after seventy years. They hold one another and they weep. A policeman in Dallas covers a woman and her sons with his own body: he literally lies on top of them to shield them from a sniper’s bullets. And the surgeon, who has just told his patient that he might have cancer, sits for a moment and asks that patient about his life, about his work and where he lives. Sees him as a whole person, not simply a lung or a white spot on a CT scan.